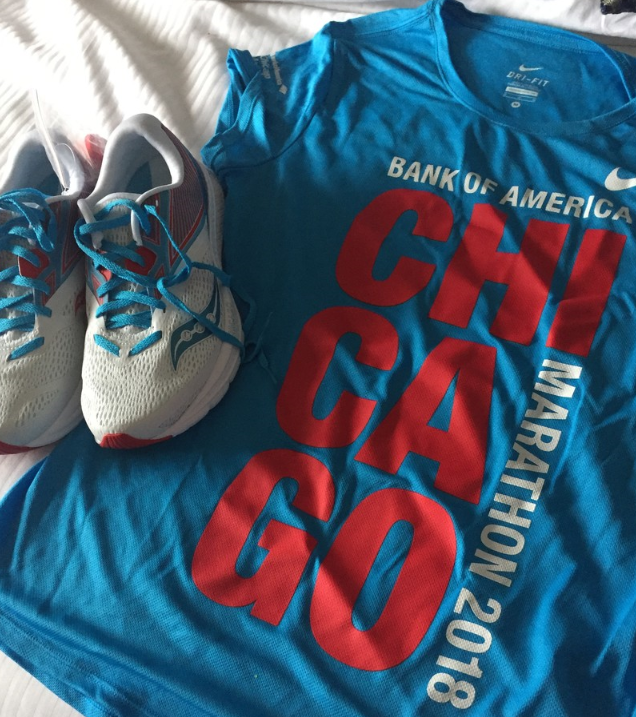 The Chicago Marathon meant a lot to me for many reasons – but the first and foremost was that I was running it to raise awareness about Pulmonary Hypertension (PH) and to raise funds for the family of my amazing niece Mia, who has the disease. The cost of PH meds is staggering, so early on I had decided to dedicate this race to Mia. I flew out from Toronto on Friday morning and thankfully had just one minor delay with my flight. We took transit to get to our hotel – the Westin North Michigan (I’d totally recommend this hotel – it’s a bit further from the start line than other options but the staff were really great!). Once we got settled in our room, we took a nice long walk down to the expo. Although we didn’t take advantage of the free shuttles to get there, I wanted to give a shout out to the race organizers for this – such a nice touch! After picking up my bib, I wandered the expo with my (non-runner) husband. It was so much fun to be there with someone who isn’t familiar with the expo scene – he loved helping me explore the booths and pick up swag. Since Chicago was my first World Major, I was really excited to get some good gear and the expo did not disappoint. Saturday night featured some pretty intense thunderstorms. Thankfully, they passed by the morning ….but they did make me nervous about the weather for Sunday. We walked around the Lincoln Park zoo and conservatory and visited a few other nearby landmarks before heading back to the hotel to get ready for the big day. I prepped my outfit, fuel and the items that I wanted to leave at the bag drop area, and turned in for an early night. My pre-race meal was mostly chicken breast, veggies and baked sweet potato from a hot counter we found close to our hotel. I set my alarm for just before 5 a.m. I made a coffee in the room and then, because I was still half asleep, I forgot to take out the filter and ended up with coffee oatmeal (I DO NOT RECOMMEND THIS….but I still ate it LOL). Outside, it was coolish and there was a bit of drizzle as I headed to the starting area. I was worried about staying warm if the rain got any worse, but luckily it held off. I was in corral K, which was the next-to-last corral. Since I had gotten to the starting area nice and early, I was able to get in a couple of port-a-potty stops before the lines got insanely long. Winning! My race began and my corral began to creep towards the front. It took a good while for us to finally reach the start chute and cross the line. The first few miles took us through the tall buildings of downtown. I started out nice and easy, not worrying about the runners who passed me. 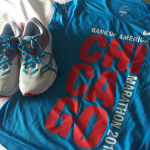 Actually, I felt great – I was so excited that after so many weeks and months of hard work and anticipation, I was finally running the freaking Chicago Marathon. Running through all of the different neighborhoods in Chicago was really cool. Despite the less than ideal conditions, the streets were lined with spectators out supporting the runners. 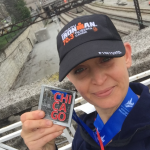 At around mile 11, I knew that I was a little behind where I wanted to be and I started to feel a bit nervous that I wasn’t going to hit my personal goal for the race. 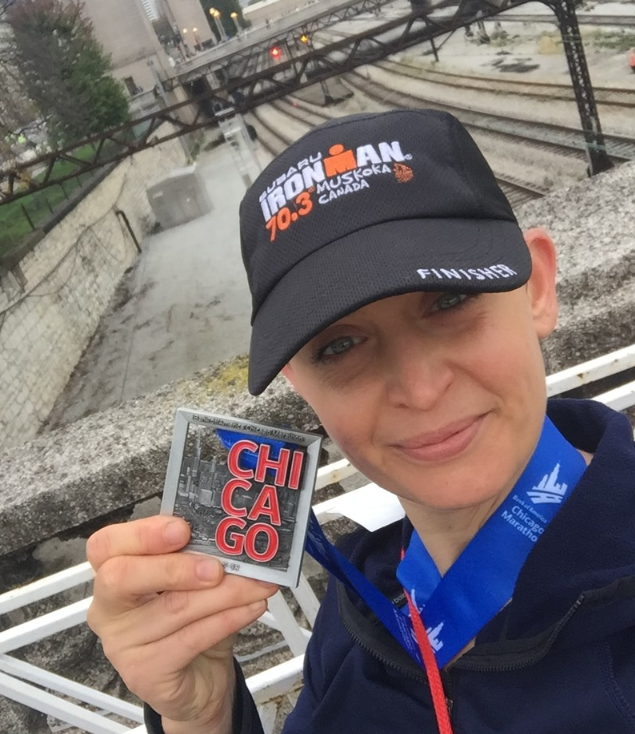 By around mile 16, I was relying heavily on my mantras (Rule #5!!) and trying to stay strong. That’s when I decided to ease up and to try to have fun and enjoy the crowds and the experience as much as I could to the finish. I tried not to let myself walk, but decided that I would run slower. I finished in 4:45 (though my watch said 4:37 since I stopped for a potty with a long line), which is still a good marathon time and definitely not something to be ashamed of. Overall, I had an amazing time in Chicago. The people were so nice and friendly, the crowds were amazing and the volunteers/staff were super helpful. And, to be honest, I don’t think I’m quite through with marathons yet. I think that I have a lot to learn and a lot of room to grow. I hope to be ready to take on another one in a year or two. And I would be remiss not to a HUGE THANK YOU to everyone who supported me. If you donated to my fundraising efforts, I am so grateful. I ended up raising just north of $1400 for Mia and her family. If you cheered for me, THANK YOU. All of the positive vibes and support I felt throughout this training cycle was incredible.